As summer begins to wind down, Cape Region golfers who typically wear golf hats due to thinning or non-existent hair often need to make a fashion decision. Should they toss aside the by-now heavily stained caps, or toss them in the dishwasher in hopes of cleaning them up a bit? The folks at Imperial Headwear now offer a different solution, using Coolcore fabrics. In a February 2015 column, I discussed going to an Imperial press conference at the PGA Merchandise Show in Orlando, FL in late January. Imperial sells thousands of golf hats, at tournaments and pro shops throughout the golfing world. As the spokespersons described their new product line, the new textile is claimed to reduce surface temperature by up to 30%, by combining elements of wicking, moisture transportation, and a regulated evaporation rate. It also carries a UPF 45+ designation. Wicking moves sweat from the body to the outside of the fabric. Moisture transportation avoids saturating portions of the fabric, and accelerates drying. Regulated evaporation provides a noticeable cooling effect. At the press conference, they provided a short demonstration with a fabric swatch, and also handed out a special cooling cloth made with the same Coolcore fabrics as their upcoming hat line. The Imperial spokesman also suggested the new fabric should reduce the sweat stains that plague golfers in hot, humid climates. I received a sample of the new Imperial hat in May, shortly after the line became available in the United States. My version was The Marimekko CC010, in navy, with a Sea Island logo stitched in front. This Imperial hat was subjected to all the usual cruelties that my cotton golf hats receive, including the caps from my Eagle-level membership in the United States Golf Association. It kept my head covered during practice range sessions, during most of my summer rounds, and while reporting on the LPGA Shoprite Classic and the United States Women’s Open championships. I was pleasantly surprised to discover that the hat’s performance matched what I’d been told by the marketing folks. The hat is noticeably lighter, cooler than the cotton golf hats, and will not show a stain for more than a half-hour or so. For example, if I hit a full bucket of balls at The Rookery South’s range on a typical August morning, at the end of the session I will see inch-wide sweat marks at the front of the hat where the bill connects to the cap. Unlike the cotton caps, however, those marks soon disappear, which I attribute to the wicking and moisture transportation elements of the new fabric. 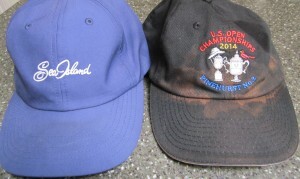 The photo accompanying this column shows the drastic difference in sweat effects between this new model and a cotton golf cap. The version I was sent comes in four other colors besides navy, including black, grey, red, and white. At Imperialsports.com, the hats retail for $35. You might also check with your favorite golf course pro shop or golf retail outlet. 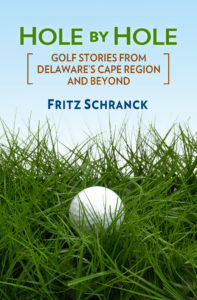 The Peninsula Golf & Country Club hosted this year’s Mid-Open Championship, a popular tournament on the Delaware State Golf Association schedule. Players must be at least 35, with a handicap index of 18.0 or lower. The golfers are then put into flights, with golf pros competing in their own category. John R. Lynch, a Selbyville resident and a golf pro at Wild Quail Golf & Country Club, won the pro category with a one-under par 71. Tad Kaufman of Berlin, MD was the low amateur, and also posted a 71. Two Cape Region amateurs finished in a tie for third place overall, at even par: Ed Brown of Rehoboth Beach Country Club, and Chase Brockstedt of Kings Creek Country Club. Brockstedt also won first place in the second flight, while Brown finished one back of Kaufman in the first flight. Tim Gallagher, an amateur playing out of The Rookery, finished in third place in the sixth flight. The Kings Creek Country Club Ladies 18 Hole Golf League played their Three Blind Mice game August 20. Kathy Casey won first place in the first flight, with Barbara Wisneski taking second and Karen Harrington in third. Dorrie Spilman won the second flight, followed by Atom Irwin and then Sheree Mixell. Mixell also won the closest to the pin contest for the day. Joanne Yurik took first spot in the third flight, with Margaret Moore finishing second and Prabhat Karapurkar taking third. The Sussex Pines Ladies 18 Hole Golf Association played a “5 of Clubs” tournament August 25. The format limits players to using only five clubs in their bags. Terry Daisey won first place, with Susan Shockley taking second and Sue Brady finishing in third place.